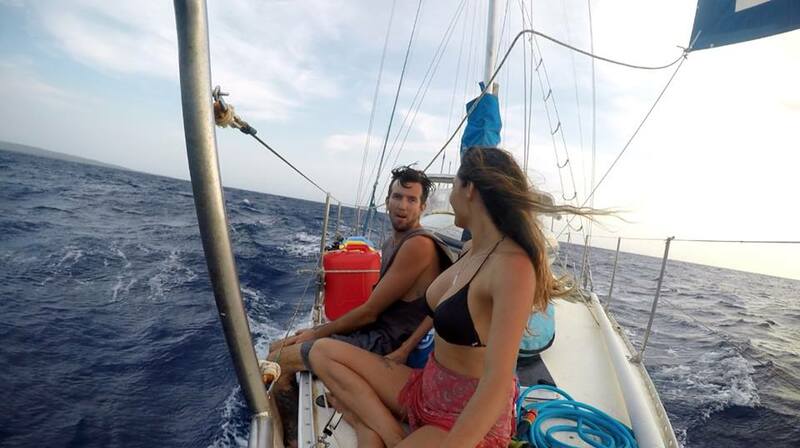 Couple left everything and bought a boat to sail the world: Passion, patience and a good partner is all you need! 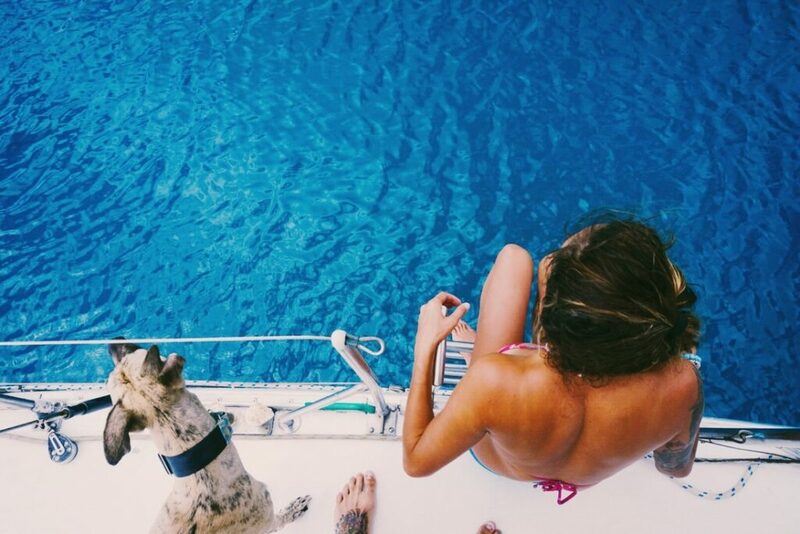 Have you always been in love with sailing and when did this love exactly happen? What was the trigger that made you say: ‘Let’s go!’? 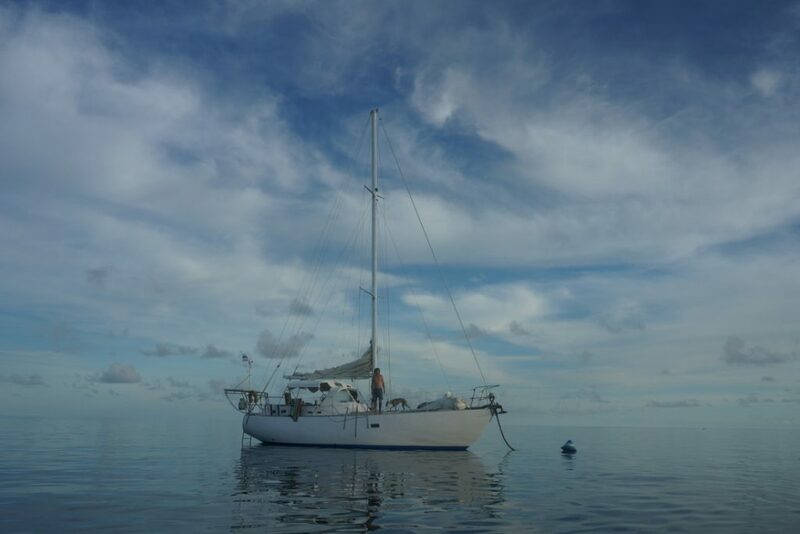 Before buying Nandji we had no previous sailing experience, it was the love for the ocean that drew us towards living on a yacht. Before buying Nandji we lived in an old school coaster bus that was converted into a house. We followed the Western Australian coastline for 2 years in search for the holy grail park with ocean views, a perfect wave and reef. 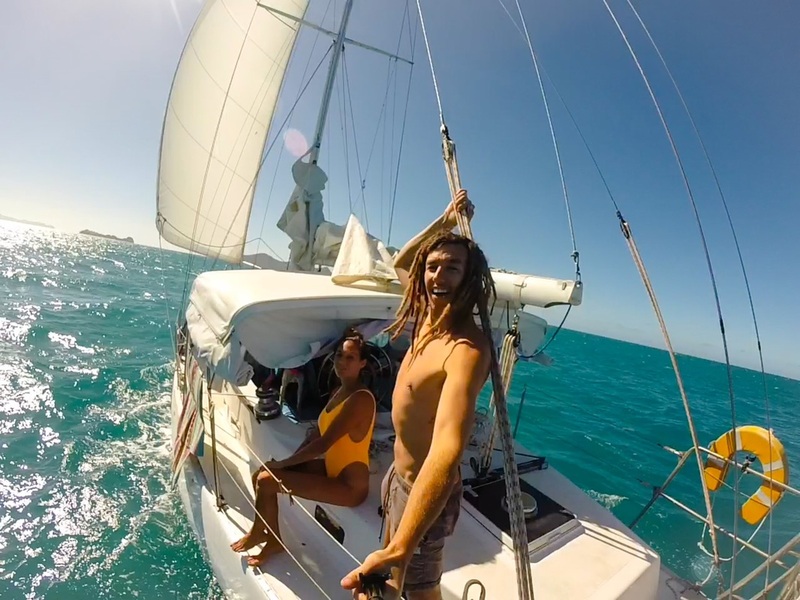 In our bus we could travel across our beloved Australia but with a sailboat our horizon expanded, the possibilities of destinations became limitless, we can go anywhere in the world with a sailboat. I don’t think there’s a better place wed rather live. From the very start we searched for boats designed for offshore cruising that could safely take us around the world so I think we were saying “lets go” before it even begun! You have been travelling around Australia for two years previous to this nautical adventure of yours. When and why have you decided to buy a boat, what type of a boat is it and how did you come up with a name? Purchasing Nandji happened quite fast, it took around 5 or 6 months to sell the bus and buy the boat after that initial idea. 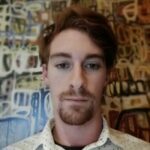 We were living cheaply and had saved up for a house deposit as we worked our way around Western Australia. We were In the market to buy a house and even went to a couple of house inspections. The prices of houses in Australia is mind boggling and the thought of working 12 hours days for the next 50 years to pay it off, daunted us. It felt like something we were meant to do, but deep down wasn’t something either of us wanted. How can we possibly live in one place? Once we realized our passions were aligned for travelling and being on the move, the decision was set that we were going to buy a sail boat. Nandji is a Roberts 40 cutter rig sloop with a full keel. She is made of strip Cedar wood, sandwiched between fiberglass. Nandji was her name when we bought her. To change the name of a boat is a bad oman, and we needed all the luck we could get! To change the name there is a big ceremony that needs to take place and you have to have done extensive work on it to earn the right to change the name. Nandji means Joy in Hindu so we stuck with it and think its pretty fitting. You are currently having issues with your motor? What happened? You have been raising donations to help you fix your problem and, if we understood your situation correctly, you achieved your goal. When and where you will get your engine fixed? Our old engine is exactly that. Old. It was made 30 years ago and has been causing us a lot of problems over the past year. We can no longer buy new parts for it so rather than replacing the broken parts they will need to be rebuilt. If we cannot rebuild these parts, we will need to replace them with second hand parts and who knows how long they will last. We figured why throw money into something that is only going to keep giving us dramas? We want to be able to rely on our engine and It was time for an upgrade to Nandji. Yes we can hardly believe it! We reached our goal for the new engine, it’s currently sitting in a wooden crate with a tarp over it next to Nandji ready to install! Its very heartwarming to know that our audience understands the struggle we have had this past year and are willing to chip in a little to see us safe and keep the journey going! We have the best following in the world and we are very grateful. We will keep the generosity of our followers at the front of our minds as we travel and seek to pass it on. We had the option of either returning to Australia for the refit, or keep the adventure going and sail 2000nms to Langkawi, Malaysia. We chose Langkawi as it is a tax free island for importing goods so no import tax was paid upon the new engine. The island is a yachty hub with a variety of boatyards, experienced workers and lots of boats! So here we are! We arrived a few days ago. Where has Nandji taken you so far? Do you have some prepared routes or are you deciding where you want to go in the moment? What countries have you visited so far? What did you like the best and is there some final destination where you want to go? So far Nandji has taken us 10,000nm offshore. 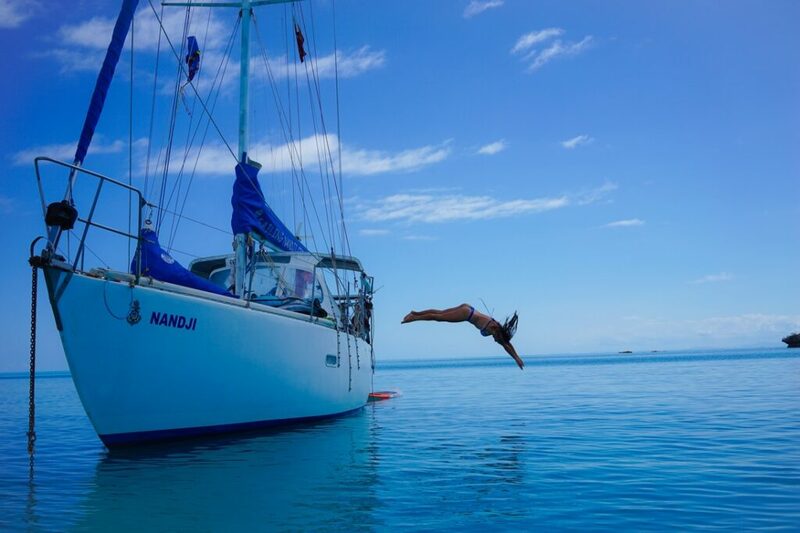 We first moved aboard Nandji in Airlie beach, Queensland Australia. We learnt to sail around the Whitsunday islands and then headed south down the coast to the Brisbane area. We departed Australia in July 2017 from the Gold coast and sailed across the Coral sea to New Caledonia. We cruised the stunning islands of New Cal, sailed up to Vanuatu, spent cyclone season in the Solomon Islands, then headed through Papua New Guinea and onto Indonesia. We sailed South to Timor Leste before returning to Indonesia and then west to Malaysia where we are now! We really didn’t know where this journey would take us when we left Australia. We didn’t know if we would even like sailing offshore so the route we have taken was very much so made up as we went along and gained more experience and confidence. Our route thus far has been a little different to most sailors travelling in the trades. 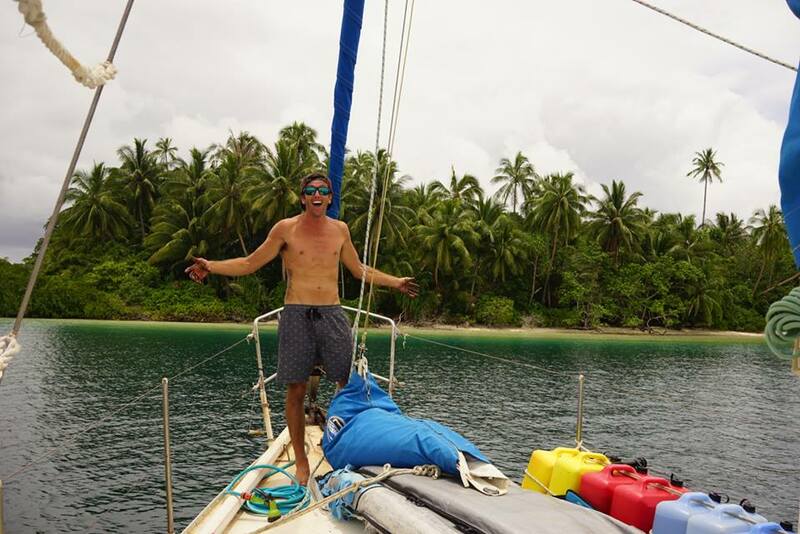 Spending cyclone season in the Solomon Islands was something not a whole lot of yachties have done before. We saw 6 sailboats there in the 6 months we were cruising, the waters are uncharted and we had to really dig for information on the area. Also not a lot of sailors take the northern route across Papua New Guinea so we met with communities that have not seen a boat for a very long time. The Solomon Islands and Papua New Guinea will always have a special place in our hearts as its rich in culture, people still live the way they always have speaking their native language, living off the land in harmony with nature. We thought that was really special. Our final destination at this point is Australia once again, meaning we wish to sail all the way around world in the trade winds to return. We are currently preparing Nandji for this next huge adventure of crossing the Indian Ocean. It’s been a dream of ours for a long time and is something we think about every single day. Along with the new engine we are doing other boat work to make sure she is safe for the passage. Our goals are set on reaching South Africa for now and everything else will follow when we get there! What are your everyday difficulties with living on board? How hard is living on a boat? Where do you get your supplies? The biggest thing about living on a small boat is that every little task takes twice as long as living on the land. A simple task as doing the dishes takes forever as we need to boil water on the stove. Then to keep the boat tidy takes more effort than first thought. If you want to get something out of the cupboard, you basically have to take everything out of there and put it all back as storage space is limited. Things get lost so fast on a boat. Each individual item has a home but we still spend half our time looking for things! Living on a boat has its challenges, especially if you do sleep at anchor and not in the comforts of a marina or a quality mooring ball. We have to always pay close attention to the weather and sleep with one eye open in case weather comes in. In the tropics, heavy squalls form quickly and can arrive with forces sometimes blowing 50+ knots. We have a good anchor now so no longer drag anchor, but whenever there is strong wind at anchor it is hard to sleep. We always need to think and be prepared for the weather so finding shelter to anchor is always at the top of our list. Sometimes this means a long tender ride to find supplies! Supplies are always an experience in a new anchorage, new village, new country! We need to try to find a safe place to leave our tender and then walk to the shops. Often we have to wait until local market day to find fresh produce and then we must adjust to never finding western food. It is great fun and all a part of travelling but sometimes we are left very frustrated at not being able to provision for a week long passage ahead and only have rice and hopefully catch fish to eat. What is the biggest advantage living on a boat compared to living on land? The biggest advantage, there are so many advantages! Here’s a few.. we have the worlds biggest pool right outside our bunk. If we don’t like where we live, we can move. We have a hatch above our bed so we fall asleep looking at the stars and wakeup to the sunshine on our faces. As mother nature rules our whole world, we feel more connected to her. We don’t have much space so we only buy things we NEED rather than want. It has taught us to live a simpler life and appreciate the little things like drinking cold water, having a fresh water shower, the smell of land, broccoli, a moon light night. Bonita had some health related issues a while back. Are you ok Bonita? Has there been any other health issues along the way and how have you resolved them? Is it tricky to be far away from hospital when you need one? Yes I am fine now. It was a little scare as I discovered a lump in my breast and it was causing me pain. I had first noticed it at sea whilst on passage and when at sea a million thoughts go through your head as you are a long way away from medical help with not a lot of distractions around from your thoughts. I had never had this before and lucky there is no history of breast cancer in my family, but it really scared us. It is tricky in these times and then also travelling in remote and developing countries, means western health facalities are not available. This time around I returned to Australia for all the professional help whilst Yosh and Marley looked after Nandji. I got the all clear and am all good. A reminder to check yourselves ladies and gentlemen. We carry a well stocked first aid kit including items like penicillin, anti biotics, peroxide, iodine, pain killers, bandages etc. and we are both First aid trained but there is only so much we can deal with. Yosh had an infection which scared us for a while but lucky we had plenty of antibiotics and we managed to stop the infection. Passion, patience and a good partner. Knowing a few things about the ocean and weather will go a long way for safety and avoiding any bad times. But the biggest thing is you have to be committed! You have to really want this and for us, we are lucky that we both have the same goals and want to achieve the same things. For many people, their partner is perhaps not as interested and it is generally just one persons dream to sail. It has to be both of you or else it will never work. You live in a very small space together and you are never really away from each other so you really have to love the other person! If its your dream believe in yourself and work everyday to achieve it, you will get there! As for sailing tips, I am no expert and never will be. We read lots of books, watched a lot of Youtube and once on board Nandji, chat to so many old Salts. The sailing community is really friendly and most sailors are more than willing to help you out and lend their advice if asked. We have learnt a lot from listening to other sailors and making mistakes. Never be afraid of making mistakes, it is how you learn and is all part of the fun! You are quite active on social media. There are a lot of people who are interested in your adventures. What are your plans for future? Will you ever come back to the land? What can your followers expect in upcoming months? Where do you see yourself in 5 years? Our immediate plans for the future involve getting Nandji ready to cross the Indina Ocean. Therefore the next month or so will involve tremendous amounts of boat work. We have a list as long as a piece of string and plan to complete all of this! From Malaysia we will return to Indonesia to West Sumatra for a few months waiting for the right weather window to head to Chagos and onto Madagasscar, then arrive to South Africa for Christmas! Once we cross the Indian we plan to continue sailing to fulfill our dream of circumnavigating the world. This is the longest plan we have had ever! 5 years from now? Maybe we will be somewhere in the Pacific… 5 years is a long time my friend but I am sure we will be on Nandji chasing the sun somewhere. Read your story and it is so inspiring. Thanks!! I can see your love of sailing through your life’s decision and adventure. Carry on sailing. You are both such an inspiration, I love you both for your spirit of adventure. And your love for each other is paramount. Look out for me on Salamands, about to start sailing from the carribean. i will definitely be looking out for you, and keeping track of your progress over the seas.